Windows Media Player, the defualt media player in windows is one of the most known player to people using windows as thier operating system. Windows Media Player ( WMP ) has always had certain limitations with playable formats, to solve this purpose, today we have gathered some of the best free alternatives to windows media player which are capable of playing and enhancing user experience with tons of extra features. WMP does have supporting plugins which enables the FLV format like playflv plugin. But those who want options and want something different from WMP here are the best free video players that can replace windows media player. VLC : “It plays everything!” The media player that fulfills all your needs. It handles DVDs, (S)VCDs, Audio CDs, web streams, TV cards and much more. With VLC, there is no need to continually update many different codec packs. VLC comes with nearly every codec built in! And whats more, VLC can play back your files, even if the media is damaged! Missing or broken pieces wont stop VLC. All the video and audio information that remains can be played. Winamp : Winamp is for people who like to customize, tinker and tweak: offering the widest range of extensions, skins, and services to add to your listening experience. Media Player Classic : Its small size, low memory footprint, and numerous features make this the media player of choice, but you must add the proper codecs to perfect this freeware. 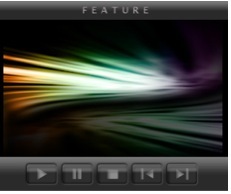 Media Player Classic’s interface reflects its title–retro, old school, basic. This single player easily replaces the four or five video players installed on most systems. The only caveat is that you must download a complete set of codecs to play your favorite video formats. Media Player Classic also easily loads and plays DVDs. We liked how you can easily increase or decrease playback speed. foobar2000 : Its an advanced freeware audio player for the Windows platform. Some of the basic features include full unicode support, ReplayGain support and native support for several popular audio formats. Songbird : If you want an Open Source -customizable alternative to WMP, Songbird is the way to go. It is highly customizable with a host of plug-ins and offers the user endless hours of seamless playback. Clarity and customization come naturally to this software, which is true to its name and easily syncs with most media players and smart phones. GOM Player : There are an endless number of advanced features. Customize brightness, contrast and saturation. Sharpen and add noise to your video. Try the audio equalizer. Repeat a section of your video with our A-B Repeat feature. Fast forward/rewind a few seconds using left/right keys. Let us know which players do you use in the comments below, and we will update this list of free replacements to the windows media player.